We have now had the first concept plans for the updating of our Meeting House from our architects, Richard Potter and Erin McLoughlin of RPA Architecture. They presented two options to the Newbury Project Management Group, Scheme A and Scheme B. The plans were then shared with Mid Thames Quakers’ trustees and everyone in Newbury Meeting and put on display on Sunday mornings with a comments book. There was a great deal of interest and discussion as you can see from the photo with lots of imaginative and creative ideas. All the comments were discussed at our Business Meeting on Sunday, April 7th and a list of possible alterations will be agreed and sent back to the architect. 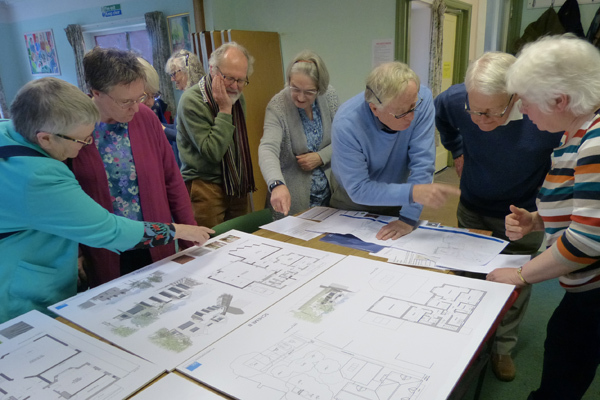 We anticipate a lot of ‘to-ing a fro-ing’ as we fine tune the plans to fit our current needs and try to anticipate the needs of future Quakers in Newbury.